Apparently Brad Bird (THE INCREDIBLES) turned down the opportunity to direct the new STAR WARS movie to make TOMORROWLAND which shows that he's a numskull. But maybe we should all be relieved if his new clunker, TOMORROWLAND, is anything to go by. This may well be the worst live action movie that Disney has ever made, and it's certainly one of the most expensive. What were they thinking? Who thought George Clooney, the star of suave adult heist films was going to be a relatable anchor for a kids movie. And what made them think that Damon Lindelof, who led us all down the rabbit-hole with his TV show Lost, and then messed up the ALIEN mythos with PROMETHEUS, was going to be able to write a movie with a premise simple enough to get kids excited and on the edge of their seats? What made them think that once Shailene Woodley had turned down the role, that charisma-free actress Britt Robertson would be able to fill her shoes? Instead, what we have is a monumentally clunky movie that no-one really gets - that takes forever to get us to excitement of the future - and when it does, is a monumental downer. So let's get back to the premise of the film. If any of you have read or seen LORD OF THE RINGS, you will know the character of Denethor, Steward of Gondor. He has used his magical seeing stone, the Palantir, to give him a vision of the future - a future of the destruction of his world - and instead of doing anything about it, he sinks into despair, and it becomes a near self-fulfilling prophesy. This is basically what Brad Bird thinks that we earthlings are doing right now. We're letting our world suffer environmental degradation, starvation, obesity and governmental breakdown and that we don't have the courage to stand up and fight for our civilisation. And then, instead of creating a true Tomorrowland he actually creates a movie that's a throwback to the 1960s when the future was the Jetsons and rocket packs and material invention. And so as this movie slowly unfolds, we see George Clooney's character as a young kid who is a budding inventor who goes to the 1964 New York World Fair. At the fair, a mysterious young girl called Athena gives him a badge that takes him Tomorrowland - a shiny new place where all of earth's best inventors are creating a better future. It's not entirely clear how all this works, but hey. We then move into the present day where the now ageing and cynical George Clooney meets another young scientist called Casey. She has all the optimism that he has lost and persuades him they can fix whatever travesty has occurred in the future, with Hugh Laurie in some spectacular trousers, as the Denethor figure. It's amazing to me that this film is trying to be all about rejecting dystopian films and apocalyptic visions of the future, and wants us to embrace our inner child and be hopeful and energetic in crafting a better future. Because this movie never shows us that or inspires us with that vision, but is a massive downer, scaring us about our own apathy. Ironically, it is EXACTLY a dystopian movie - MAD MAX: FURY ROAD - that is far more exciting and energising and, in the character of Charlize Theron, gives us a better role model for a girl taking control of her destiny and changing the world for the better. The other thing I would like to point out is the bizarre squeamishness of seeing George Clooney playing what is essentially a lover's reconciliation scene with Athena - a robot 12 year old girl. It's meant to be touching but am I the only one who found this really weirdly awkward? 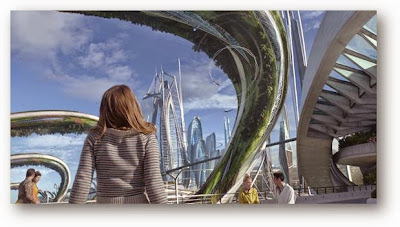 TOMORROWLAND has a running time of 130 minutes and is rated PG. The movie is on global release.